I seriously have no idea what I should write so maybe I shouldn't have written this post. But I feel like I have to? Hmm. Briefly, these days in terms of work nothing much to say there except its work. Honestly, I want to say I'm enjoying it but I don't want it to come back and haunt me. In terms of latest gaming trend in smart phones, you guys know what I'm talking about. I swear if I see a TRIPOD one more time...! But I guess Draw Something has its benefits. We're actually developing our drawing skills! I mean how many FIRE have I drawn since I started playing this game? And stick men are certainly taking over our perception of a how a human should look like. Well, one thing productive I did today is I helped my dad clear out the debris/stones/sand at the junction of the road in front of our house. Only thing is I only managed to work for 15 mins before I started feeling dizzy from the heat. So fail! And of course I never end a post without a picture but since I hardly take any pictures these days, I guess this will do. I recently scanned some old photos so I figure I'd share one with you. 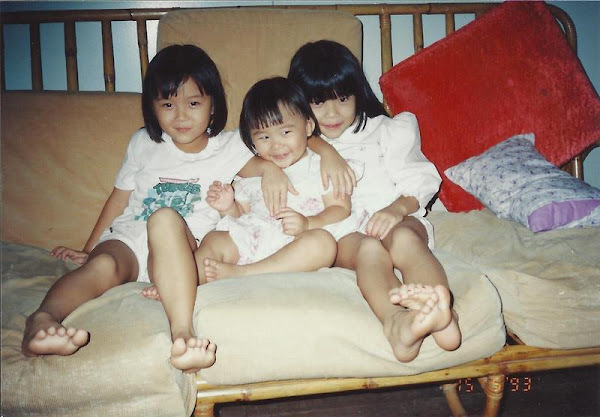 I think this is a lovely photo of the three of us during the pre-Stephen years. No need to point out which one is me. I'll let you decide if you don't already know. 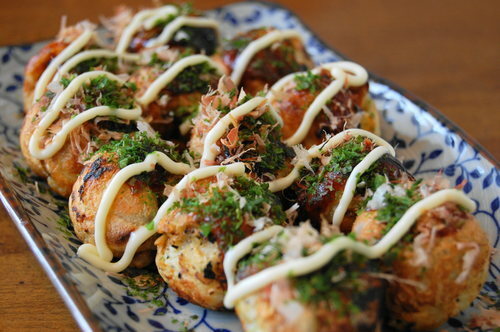 Takoyaki is a popular Japanese street food that one can easily enjoy in many Japanese restaurants around the world. It is no stranger to us in this country as it has been around for years, my most memorable having been that located at the basement of The Mall. Basically, it is a ball-shape pancake made primarily with a mixed batter containing diced octopus, and cooked in a special pan with round indentations. Cooking it requires skill, no doubt. This dish is served with special takoyaki sauce and Japanese Mayonnaise and I can assure you it tastes amazing. I was having my dinner at Excapade the other day when I found another dish that tastes very much like Takoyaki. It's the Japanese Pizza, as you can see below. I wonder if they are one and the same. The only difference is there are much more variety of mixed vegetables in this pizza. I tasted carrots and mushroom. Other than that, I would say they are very similar. I would really recommend this dish if you're a fan of takoyaki. You should definitely give this a try the next time you pop by Excapade. Last week was Emblem Night for our department and I joined as one of the committees. Honestly, I didn't want to go at first because I'm not much of a dress person but I managed to find a nice dress, just a simple one even though they had a masquerade theme. The apprentices and attachment people, all committee members for the night! It was quite a tiring but fun night, definitely worth dressing up for. I met quite a number of people, old and new so it was a great exposure for me, definitely. Credit to Sel for the pictures! Back when my sisters and I were young, we used to enjoy collecting stamps. I guess we got it from our mom. Like many (or maybe some) 90s kids, we had penpals and exchanged friendship booklets. If you know how a friendship booklet look like, you're probably getting old. So we would have lots of stamps from all those snail mails and keep them in stamp albums. If you recall, retrieving a stamp from an envelope is a delicate job. You have to rinse it in the water for a few minutes before you can peel the stamp off the envelope, and also at the same time you have to be careful not to tear the stamp. I was looking through our old stamp albums and I came across some stamps I just feel like sharing with you. This "Thinking of You" stamps from The Philippines was my all time favourite when I was a child. I think the reason is because it's a cartoon and pink: two of my favourite things - combined! I have no idea where we got this stamp from but it must be very old since it's only worth half a cent. There's even Chinese lettering on the stamp so that must've been before the 50s. Here are some stamps presumably from China and possibly printed in the post World War era. And here are some old Pilipinas stamps from the 80s. This one is probably from my mom's collection. It's hard to tell because we mix all the stamps up. I guess you can say the collection is a combined effort from all four of us. I really like this particular Nippon stamp showing a woman doing martial art. It protrudes feminine strength as opposed to olden presumptions on gender differences. It's really nice to see a vast collection of stamps from various places. Although we stopped collecting stamps a long time ago, there is always value treasured by us four in this little hobby of ours. The joy of collecting paper-based materials is one that not many kids treasure these days.